My good friend Dyana Valentine took this photo of her friend's necklace while on holiday in Big Sur. No matter if a Journey Life Lens™ is a strong preference of yours or if you avoid it all costs (preferring a Destination Life Lens™) we’ve all got to deal. Deal with the open road and the horizon that beckons. Find our own path that works. For us. Some look forward. To the destination. Some look around. At the journey. Some of us get ‘there’ faster than others, that’s the whole point no? Gotta check it off my list and then onto another horizon. Others meander, tracing an organic, iterative path. You gotta stop and smell the flowers folks! Whatever journey this new year brings, whether it’s measured, secure and contained or wild with risk and opportunities, I wish you your own form of reward. Perspective on public peeing - are public toilets a gift? What's more complicated - flying a plane or juggling three TV remotes? Calling all goal-oriented, focused folk. Are you a Destination Life Lens™? Calling all wayward travelers. Are you a Journey Life Lens™? This entry was posted in Journey Life Lenses and tagged destination lens, journey lens. Bookmark the permalink. 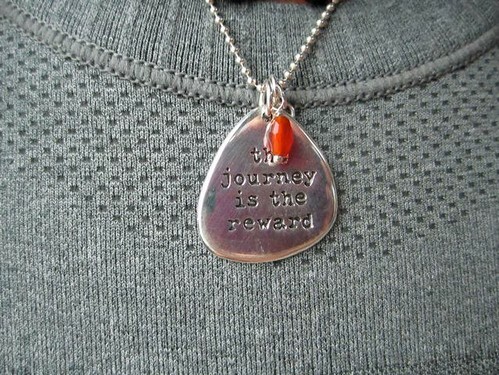 LOVE it–I was thinking about my Journey-ness yesterday, while traveling to Santa Fe. I got to LAX by taxi (because I wanted more time in the morning and also wanted the luxury of stopping on the way to get some cash, which riding the bus wouldn’t have allowed me to do as efficiently). I thought the idea was more Destination-oriented, but then realized that the riveting conversation I had with the taxi driver (about the differences between Bagdad/Muslim culture and LA life) was really what interested me (though I couldn’t have planned for it). There were subsequent delays in the trip, which didn’t bother me at all because they allowed for really interesting connections with others at the gate, and then my ahh-who-cares-if-I-missed-the-shuttle yielded awesome locals-only restaurant recommendations and a priceless story about unusual leadership. So, yeah, I’m a Journey woman with a splash of Destination for good measure. Hey Journey woman with a splash of destination; I admire how your journey allows you to appreciate (& affect) the destination. I also find it intriguing how your journey lens influences what is really a destination focused role (helping self-starters, self finish). Perhaps it’s because you make the journey interesting and worthwhile and educational, that they reach their destination. Do tell, what’s the priceless story about unusual leadership? Or if that’s going to be blog post let me know & I’ll link to it. Nobody does journey traveling like you; am remembering you confidently marching into a legion to hang & ask about burger recommendations.